Curious why the 2019 Estimated Tax Increase is so High (8.5%)? You Should Be. Read below two very insightful resident letters that indentify concerns about the recently released 2019 Budget and a number of additional serious issues. For a number of years now residents have requested that the District provide a much clearer Financial Picture of the annual Financial Plan expenditures. That request can certainly be applied to this year’s 2019, 50 page “hide & seek” document. There is a vague reference to an 8.5% estimated property tax increase in 2019. The explanation offered for such an extreme percentage is that it is the result of “new budget drivers”: These are listed as Employee Health Tax; Contractual (inflation) Increases; Infrastructure and Pavement Management and Capital Increases”. However, all Districts face these three budget drivers do they not? But they don’t have such extreme estimated tax increases! Almost all Municipalities have to pay the additional Employee Health Tax; every community has aging infrastructure improvement costs as reported prior to the election; and personnel costs for Civic Staff: Police and Fire are Union-negotiated and standard across municipalities as pointed in a previous Oak Bay Watch May 15th, 2018 Newsletter (see Appendix #1). So what are the other “budget drivers Involved”? An administration staff hiring spree that included some pretty hefty salaries. In addition, these are subject to escalation and have led to higher salary categories over the years and will continue to grow. A significant number of expensive Consultant contracts the benefits of which have still not been revealed. A steady increase in the Planning Department’s costs to process developments, only a fraction of which is recovered in fees. Although not the case in Oak Bay almost all Districts charge developers for the impact costs of their development (e.g Development Cost Charges – DCC’s). As a result, other Districts use this substantial funding (hundreds of thousands of dollars) to keep property taxes increases in check. Developers, not residents, must pay for these development impacts. More details on this issue see future oakbaywatch.com newsletters). A similar “creative” annual tax increase explanation is being used this year (2019) that was provided in 2018. Then as now some of the reasons (drivers) for such a large annual tax increase were provided but ­not all. What was even more “inventive” in 2018 was multi-year Police, Fire and CUPE union contract wage settlements that were attributed to the large 2018 tax increase. However, staff had forgotten or overlooked that most of this funding had already been collected in previous years. The intent had been to prevent a big spike in annual taxes in any given year. Oak Bay Watch reported in 2018: “It is safe to conclude that, according to the many Directors of Finance reports, multi-year Police, Fire and CUPE contract settlements would not be paid for in a single-year annual budget. Additionally all municipalities have these same staffing contract expirations, long-term salary and benefit negotiations and, more often than not, the same wage increase percentages (parity) as are agreed to BC wide” (see attachment #1 for more details). It is also interesting to note the Agenda for last year’s April 5, 2018 Estimates Committee Meeting lists 13 items (see Appendix #4). Item #7 of that 2018 Agenda - Operating General Fund: provides 61 pages of District Financial information. Even then there had been plenty of complaints from the public that the information did not provide enough “clarity. However, comparing that to this year’s April 10, 2019 Agenda it has only 2 items: #1. The 50 page Financial Plan Document has provided only 12 pages of Financial information. The other agenda item - #2 provides no information but promises to provide an undefined “Financial Framework”. This indicates a big step back in Financial Reporting has been taken. It also seems to us the more staff we get the more pictures, platitudes and suspect survey findings are produced. We not believe we can do a better job of critiquing the 2019 Annual Budget than the letter by a resident of Oak Bay to Council (see below). We are also providing a link to Concerned Citizen’s of Oak Bay Website. Their website provides a wealth of information on over–development, the information and advice provided to Council, insight into the development process used by the District of Oak Bay and the “judgment criteria” being used to protect the Urban Forest e.g. planting slow growing trees to replace mature trees (see Appendix #2). I would like to give you my assessment of the draft budget documents passed out at the Municipal Hall last week. Unfortunately, I was unable to attend the meeting itself, but I have gone through the documents sufficiently to gain a good impression of the state of the municipal affairs. First of all, excuse my frankness but this financial document appears to be incomplete, too focused on “be happy” and above all, lacks explanations. It appears to be a mere “update” of some previous iteration as there are no new initiatives, or items highlighted that have had increased or reduced emphasis. I want to recognize that it is a mere 4 months since the election and it takes time to change. Change brought by our new Mayor and Councilors must be reflected in this document. One gains the impression that this document reflects the past Council's desires, policy and practices. Delete the photographs, forget the surveys, reduce excessive “process”, note up front that the OCP is out of date, and recognize our new Council's views. This should be a serious nuts and bolts, dollars and cents financial document, not a PR attempt. The Draft Financial Plan (DFP) 2019-2023 should first and foremost set out the financial challenges faced by the community – old infrastructure, required increases in remuneration for union staff (police/fire/other), dependence on higher levels of government for funding of many aspects of municipal renewal, the need for policy changes such as significant development charges and license fees for secondary suites, lack of enforcement of existing by-laws etc. These could easily be highlighted in the tables! A case in point is page 11 of the Draft Financial Plan … yes, all these goals are worthy (and should be kept in a low profile page at the back), but where are the basic essential services residents demand - protective services (police, fire, first responder), garbage, water, sewer, streets …These consume the vast portion of the municipal budget so why are they not right up front? 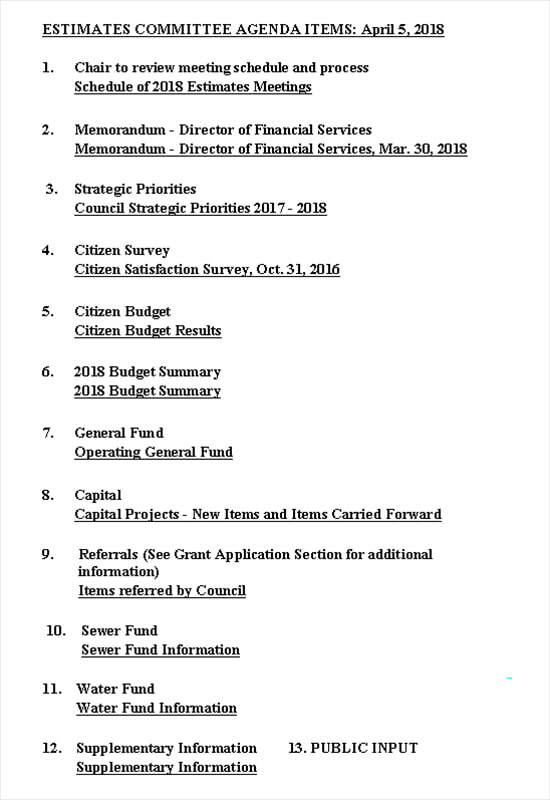 Next, could we not have a draft list of our new Council's priorities and then highlight their proposed manifestation/expenditures in the financial tables? Pages 6 and 7 of the Financial Plan are truly irrelevant and should be removed. And reading pages 18 and 19 one gets the unmistakable impression that this document is holding on to past Council's views as well as telling our new Council what they can do. e.g. “The objective of Council is to ensure that recreation fees....cover costs” (really? ), “Past Councils established an objective to …replace infrastructure on a “pay as you go” basis”. Can we not see what our current Council views are, how things may change in the future if there is insufficient time now? Page 8 is terribly instructive. It illustrates the tip of the iceberg – the 400 or so staff that Oak Bay employs. Their compensation takes up the lion's share of taxes paid directly by residents. In fact there is not much, if anything, left over and so Oak Bay depends on grants and contributions from other government levels to pay for many expenditures. This document should identify those items paid by Oak Bay taxpayers directly (e.g. staff salaries and expenses), those contracted out and those Oak Bay hopes will be paid from grants and contributions. Yes, we know staff do their best to apply for monies – this should be out in the open. Now, I would like to offer kudos for the 'high-level' explanation of the many and varied Reserves. To the best of my knowledge these have never been made public before. (Could we have a clearer explanation for Machinery and Equipment Fund please: “The fund is built up through year-end transfers of the net earnings....wages of full-time mechanics”). The Discussion Document contains references to Asset management, Housing, New Staff Initiatives, New Council Initiatives, a survey in which residents want water and sewers lines replaced as a high priority yet this is nowhere reflected in this Financial Document. Lastly, to reiterate my main concern, there is a clear lack of any connection between the Council-stated strategic plans and use of funds. It appears as if it is merely a re-jigged document from last year and nothing has changed. Further, as a public document, there is a need for less jargon and far more explanations how funds are to be spent. I have appended a list of questions related to the Budget Estimates. Perhaps the Finance Department could address them. Thank you for your work in these difficult budget deliberations. We look forward to a refreshingly clear and open budget, even it means a budget increase. Newsletter May 5, 2018 Newsletter: Oakbaywatch.com – click on newsletter for full text explaining the unacceptable excuse for yet another large budget Increase in 2018. Concerned Citizen’s of Oak Bay – Resident funded website http://www.ccn-oakbay.com/opinions provides insights on how difficult it was for the Community to acquire information and have their voices heard. What is the significance of the green highlighted areas on page 27 and subsequent pages please? pg. 27 What is “Estimated non-market growth” in plain English? pg. 27 Surely Reserves increase (i.e. sinking funds) – should be part of the regular budget? pg. 28. Why is there a budget increase of 9.3% shown when Council has not even reviewed/discussed this? pg. 28. Could we not have an explanation of what “Sales of Services” is please? pg. 28 What is in “other Revenues” please? - does this include development fees? pg. 28 Why is there a 44.7% drop in anticipated grants? Pg. 28 for such large expenditures increases such as Recreation and General Government could we not have some explanation? That's a million dollars! Pg 28. Why is the “Total Budget for the Year” line blank or is it “zero”? Pg 28. Why is the information in green at the bottom of pg 28 a duplicate of that on pg 27? Pg. 29 General Government as indicated is this all or mostly salaries? - if so could we simply not say so? Pg. 30 Why is police service administration expense half that of the $955,000 fire department? Is the police department more efficient? Pg. 31 Why is there no significant increase allocation to Roads, Storm Sewers, Sidewalks ? These are major resident complaints? Pg. 32 Parks and Recreation. This constitutes 38% of the budget yet is dismissed in one line? Far more explanation please. Pg. 33 $1,447,000 for Plant General. This is a large sum without explanation. This is not pocket change. Likewise what is pavement management for $926,700 – repaving, potholes – could we not have a few more words here? Are certain roads to be repaved - which ones? The Criticized 2018 Annual Budget Information was far more comprehensive than this year's counterpart (model).